why don't you open the middle for T side? Much better. When you picture throwing a grenade now they have to move much further giving you lots of time to dive in or at least meet them where you are both exposed. The bottom right is a murder hole, no sane person would go there and you'd be shot before you reach half way to take cover which would get filled with grenades. Top left also has an absolutely terrible entrance point and you have no place to actually take cover from grenades. 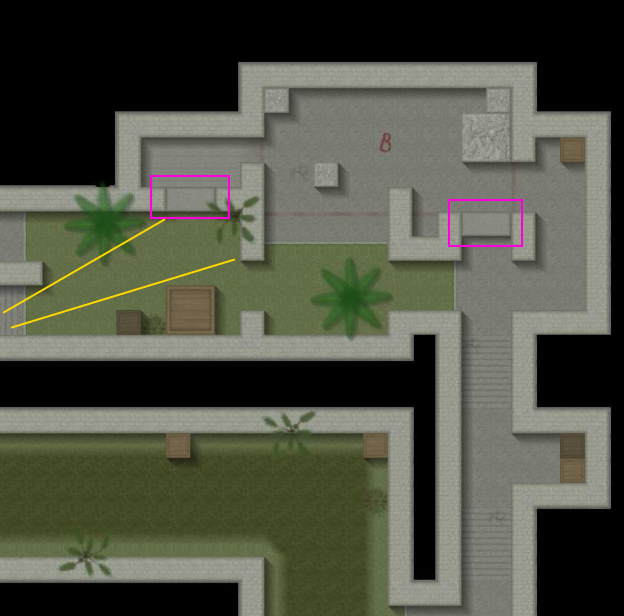 The CT's can camp, move over two tiles behind a box/wall if a grenade is thrown and get back to camping. I've never seen a more unbalanced bomb spot. @ Yates & Talented Doge: Would you both please tell me why is it unbalanced? Especially, the route to the B spot for the T side. The map layout is neat. But looks a bit unbalanced and open. Keep up the good work. The route to the B spot is unbalanced for the T side. I would never see a reason to go there other than later in the game if it even lasts that long. @ The_Admiral: This is not the problem, this is how it should be. Contrarily, you also mean that de_dust2 where is the most popular map has a problem too. The CTs should be waiting for Ts at the bombsites and when the Ts arrive, the fight begins. Biggest problem: Bombsites are always the closest to the CT spawn. Why is it called "Sunrise"?